I performed a linear mixed models on a data set that measured 'outcome' for 4 groups of individuals at 8 different time points. Individuals were modeled as random factors. Time was included as random effect in the model. Now I am not sure how to interpret this results. I assume that four linear lines are modeled for each of the 2 factors and its two levels, describing the outcome for the 4 groups over time. However, I have problems with relating the results of the fixed effect analysis to these four lines. 'Exercise' = Does the non-reference exercise group have a significant different intercept? 'Time' = Does the reference line have a significant slope? 'Time * exercise' = Is the slope of the non-reference exercise group significantly different from the slope of the reference group? So let's now consider the results with the three factors. Exercise = Does the non-reference exercise group have a significant different intercept? Genotype = Does the non-reference genotype group have a significant different intercept? Does the reference line have a significant slope? Exercise * Genotype = ????? Exercise * time = Is the slope of the non-reference exercise group significantly different from the slope of the reference group? Genotype * time = Is the slope of the non-reference genotype group significantly different from the slope of the reference group? Exercise * genotype * time = ???? I really hope you can help me! Many thanks in advance!! How to interpret an interaction effect in SPSS output for a repeated measures anova with between and within group factors? Mixed model interaction (covariate+factor): How to interpret posthoc table output in R package phia? How to interpret slope parameter estimates for linear models in R? 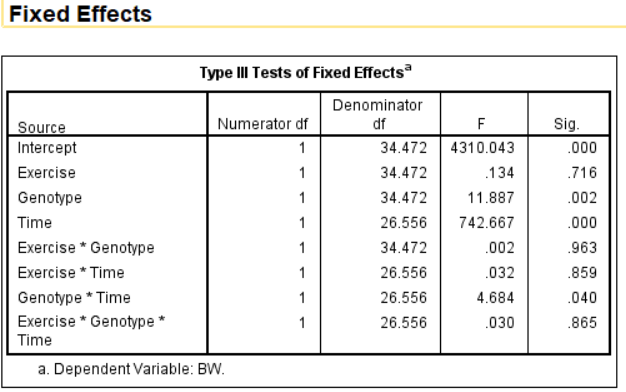 How do I interpret and visualize lme4 linear mixed effects model (lmer) results?